My works cover two domains, gravity and sedimentology, for which the intellectual concepts involved – in the absence of fundamental experiments – could lead to erroneous deductions. In conjunction with the appropriate specialists I endeavored to conduct fundamental experiments. Set out below are details, results and conclusions. I. Conception of the universe over the ages. In terms of astronomy, the original concept of the universe was based upon appearances. In fine weather navigators far from the coast saw the sky horizontally and vertically. They spoke of it as a « celestial vault », an apparent sphere which, on a clear night, moved together « carrying » the stars with it. It was described this way by Aristotle in his « De Cœlo ». Four centuries later, the astronomer Claude Ptolemy, in his work “The Almagest”, which took into account his measurements of the position of known planets, established Aristotle’s philosophical theory as a scientific theory. It was this theory that was taught in the Christian Universities of the Middle Ages. The ancient Greeks, therefore, had two philosophical schools which agreed about the existence of a sphere containing the fixed stars, but which were opposed as to whether the body at the centre of the sphere was the Sun or the Earth. Inevitably the debate resurfaced during the Christianity of the Middle Ages. Copernicus, a canon and astronomer, wondered why the planets around the Earth described irregular orbits. He re-worked the calculations of the positions of the planets measured by Ptolomy and demonstrated that they revolved around the Sun. From his calculations of their approximate distance from the Sun, he assigned them a circular orbit, which Kepler demonstrated soon after to be an ellipse, with the Sun as one focus. Copernicus reported his measurements in his book “De Revolutionibus Orbium Caelestium” published in 1543. It was sent posthumously by his friend Osiander to Pope Paul III. So far all the study concerned the planets but not the Earth. Tycho-Brahe had rightly remarked that the apparent positions of the Sun and of the planets, observed from the Earth, remained identical, whether the Sun revolved around the earth, or vice versa. The temptation, however, to consider the Earth to be a planet like any other, was too strong, and Kepler adopted the Copernican hypothesis. Then came Galileo who taught in the Padua University. Following his successes in astronomy he publicly declared himself pro-Copernican. The Earth is not the centre of the world and is moving. In spite of this condemnation, Galileo showed himself more and more Copernican. It was his work “Il Dialogo” which caused him to be condemned in 1633, in similar terms to those of the 1616 decree. His second proposition: The earth is not the centre of the world and is moving not only in space, but also in a diurnal movement around itself, was also judged absurd and false philosophically speaking and (ought to be) considered theologically speaking at least as erroneous in Faith. Galileo had not demonstrated that the sun was the centre of the world. The condemnation of the second proposition, however, resulted from the influence of Aristotle within the Church. It was not without consequences for the other scientific disciplines, as will be seen in geology, because rationalism inverses scientific reasoning. Instead of founding hypotheses on observed and experimental facts, it privileges the a priories from reasoning such as principles, postulates and laws and retaining the facts, sometimes badly interpreted, which supported them. Newton had expressed his 3 laws before referring to the facts. It was in this way from Descartes to Hegel rationalism developed. In the social and political realms the Revolution was fermented, first against the Church, followed by the monarchies, the Terror and the Napoleonic wars. In 1687, Newton formulated the laws of universal gravitation in his Principia Mathematica. Law 1:Everybody continues in its state of rest, or of uniform motion in a straight line, unless it is compelled to change that state by forces impressed upon it. His law is not strictly speaking a law of gravitation since it says: « …unless it is compelled to change that state by forces impressed upon it » Such a force is gravitation. Law II:The change of motion is proportional to the motive force impressed, and is made in the direction of the right line in which that force is impressed. To judge its validity one must refer to Newton’s proposition VI. This affirms that the weight of a body is proportional to its quantity of matter that is its mass. Its weight is the force impressed by gravity. If two bodies are considered which fall at the same time, one twice as heavy as the other, the two bodies, according to law II, should be animated by a movement twice as much as the other, which is contrary to the fact of equal movement. The law, therefore, is not exact. He applied this law to two bodies at a distance. From it he deduced the equality of the reciprocal forces of attraction, expressed by the product of the mass by the acceleration of a body. From there he calculated the mass of the sun as being equal to 330,000 times that of the earth and much greater than that of the other planets. He concluded that the sun was the centre of gravity of the solar system which included the Earth. Newton explains his law III as follows: To every action there is always opposed an equal reaction that applies to two bodies distant from each other. He says: If a horse pulls a stone attached to it by a rope, it will, so to speak, also be pulled by the stone. This is because the rope is stretched by the same effort of resistance to the traction involved which will pull the horse towards the stone and the stone towards the horse. « In this case it cannot be said that the reaction of the stone is equal to the action of the horse. In his Scholium of laws Newton states: «I am now going to briefly show the same applies to attractions. Imagine an obstacle of any kind interposed between two objects whatever A and B which mutually attract each other preventing a shock. If one of the two objects A is attracted more towards B than B towards A, the obstacle will undergo more pressure from A than from B. In consequence it will not remain in equilibrium. The strongest pressure will prevail and make the system of the two bodies and the obstacle move in a straight line in the direction of B and depart always accelerating to infinity in a vacuum, which is ab- surd and contrary to the first law. Because the system, according to this law, should continue in its state of rest or uniform movement and in consequence, the bodies would exercise an equal pressure on the obstacle by attracting each other one as much as the other. As far as I am concerned, I observe that if A attracts B more than the contrary, there is a resultant force that corresponds to the case of law I: « …except if the forces impressed (…). To say then « that this system should continue in its state of rest, or of uniform motion in a straight line, is to say there is no change in movement caused by an impressed motive force, therefore no action and reaction. Newton did not, therefore, demonstrate the gravitational equality of the action and reaction between two distant bodies; the experiment he performed with a magnet and iron showed magnetism, not gravitation. This questions the reciprocal attraction between two distant bodies where F et F’ express the reciprocal force of attraction, M and M’ the mass of the bodies, D their distance, and G a constant. It is this reciprocity that determined the calculation of the mass of the sun and the planets. In February 2014, the Royal Society together with the principal specialists measured the G constant on the theme The Newtonian constant of gravity, a constant too difficult to measure. where the variations go from 6.672 to 6.676. Is it constant or not? It should be noted, at present the effect of gravity is known but not the cause. As regards the Big Bang it was hypothesized from the fact that the light emitted from distant galaxies shows a shift towards the red end of the spectrum. By comparing it to the Doppler effect, which is the apparent variation of frequency of a train whistle passing an observer (higher pitched when approaching and lower as at moves away), and applying it to light, it was believed to demonstrate the flight of galaxies. In 1928, Hubble used it to formulate his law v=Hr, where v is the speed of recession of the galaxy, r is distance, H a constant. George Lemaître proposed the thesis of a flight of galaxies from a single explosion called the Big Bang. It has not been demonstrated factually. The phenomenon, however can be explained otherwise based upon facts. The sun is yellow at its zenith, and red to orange at setting. The color is a function of the path in the atmospheric air of the rays one sees. The rays emitted from the distant galaxies traverse the gaseous atmosphere giving rise to a red shift. Coming to Geology the other major discipline where illusions have had just as great implications: Geology. Its founder Nicolas Stenon who proposed proceeding in a very precise and ordered way according to the method of Descartes in 1667 defined the foundation of geology in his work Canis Calchariae. He interpreted the superposition of strata as a succession of sedimentary deposits. From this he deduced in Prodromus the principles of stratigraphy. These were : superposition, continuity and original horizontality of strata, which are the basis of the relative geological time-scale. Charles Lyell defined absolute chronology. In 1828 he travelled to Auvergne and examined the fresh water foliated rocks. As the foliated strata or laminæ of less than a millimeter were said to be annual de- posits, he realized the total (230 meters) would take thousands of years to form. In his « Principles of Geology » (1832) he noted that there was a 5 per cent renewal of the fauna during the « ice age ». Assuming a constant renewal (uniformitarian hypothesis) it would take twenty times longer for a « revolution » of the fauna to be produced. Now, Lyell calculated four revolutions since the end of the secondary era and eight others for the time before since the beginning of the primary era. As his contemporaneous James Croll, estimates, for astronomical reasons that glacial time lasted one million years, Lyell fixed to 240 million years the base of the primary. This figure was increased by radiometric dating to 560 million in the 20th century. It was this succession of species over a very long time that led Darwin to formulate his theory in his “Origin of the Species” in 1859. It was the natural selection of the species by the struggle for existence that produced evolution over time. Two years later, Karl Marx wrote to Lassalle: The book of Darwin is very significant. It shows that class warfare in history has its foundation in natural science. Also Engels in “Ludwig Feuerbach and the end of the German philosophy” wrote: The general demonstration made for the first time by Darwin was that all the products of nature around us now, including men, are the result of a long process of development from a small number of unicellular germs originally, and that these, in turn, stemmed from a protoplasm or from an albuminoidal body constituted from chemicals. From this “discovery” of Darwin he deduced a law of the evolution of societies : But what is true concerning nature, recognized equally as a process of historic development, is true also for the history of society in all its branches and all sciences which concern human things (and divine). (Marx, Engels, Etudes philosophiques, Ed.Sociales, pp.213-214). Scientific socialism therefore proceeds from Darwin as does, national-socialism which with its advocacy for Aryan racial supremacy. Hence the Gulag, and the Shoah with its death toll of over 60 million. The historical geology founded on the interpretation of Stenon remains unproven, because there were no witnesses to the stratification. It was this fact that led me in 1970 to develop an experimental program to study the formation of strata. In sedimentary rocks there are strata or laminæ of millimetric thickness similar to those observed by Lyell mentioned above. I took a sample (fig. 1) of « Fontainebleau sandstone » containing these laminæ . They were loosely cemented. I reduced the rock to its component particles of different sizes. I fed the sand into a glass tube (fig. 2) and saw the same laminæ form as those in the sample. The speed of sedimentation was determined by the operator. I understood that the phenomenon could be due to the sand being a powder whose mechanics are intermediate between liquids and solids. If, in a tube, three solid bodies are dropped successively, they will dispose in the order of their succession. Whilst if three liquids of different densities are dropped such as mercury, oil and water, they will superpose in the de- creasing order of their densities due to the effect of gravity. It can be expected, therefore, that gravity will cause the particles to sort out according to their size. Lamination is a mechanical phenomenon not chronological. In consequence the thousands of laminæ observed by Lyell did not correspond to hundreds of thousands of years. The report of the experiments was presented to the French Academy of Sciences by Professor Georges Millot, director of the Strasbourg Institute of Geology, dean of the University, then President of the Geological Society of France. The latter published my report in 1986. Following the publication the Professor had me admitted to the Geological Society as a sedimentologist. I did the same experiment with the rock sample containing fossils. The result was the same. It was also published by the French Academy in 1988 presented by Gorges Millot. What happens with thick strata? A report entitled Bijou Creek Flood published in the USA, authored by the American Geologist Edwin Mac Kee, referred to the stratified deposits on the banks of the Bijou Creek river. They resulted from the flood of the river from the Rocky Mountains following the melting snow increased by the rain. The phenomenon lasted less than 48 hours. With the continuity of the torrent, it could not be supposed that a first strata had hardened into rock before a second had covered it as required by the principle of superposition. The strata were approximately 10 cm thick (see figure 3). To explain the phenomenon, the fact that the flood had reached 7 m/s in turbulent conditions must be taken into account, and the speed of current varies alternatively on the surface and in depth. Sedimentologists such as Hjulstrom and Lichstvan-Lebedev, have determined experimentally the critical speed of deposit of particles of distinct sizes. In flood conditions the capacity of sedimentary transport is very high, and the variation of speed at each point when it becomes critical causes the sedimentation of quantities of particles of distinct sizes, so that the grading observed in calm water becomes strata of several centimeters thickness in turbulent conditions. In 2008 the journal Sedimentology published an article on the tsunami that struck South-East Asia in 2004 with photos of the deposits left in its wake after several hours. Super- posed strata are shown 20 cm thick. It was now necessary to study stratification in the laboratory. A report by a group of American sedimentologists operating in the hydraulics laboratory of the State University of Colorado showed the presence of strata in the deposit of a circulating flume. I visited the University and signed a contract to determine the cause of the strata. The experiments were performed by a young member of the group Pierre Julien, Professor of hydraulics and sedimentology. In a flume, the water was mixed with sand. The large particles were colored black and the small white. The mixture was circulated by a pump. 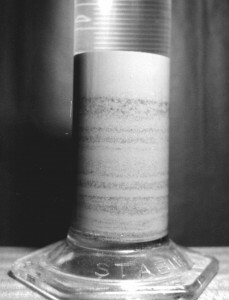 Due to the contrast of color in the particles, stratification in the sedimentary deposit can be observed. It developed laterally in the direction of the current, and vertically as it thickened. The deposit was laminated and stratified. A lateral section of the deposit shows a superposition of strata several centimeters thick as shown in the photos below. The report of the above experiment was published in 1993 by the Geological Society of France. Figure 3. 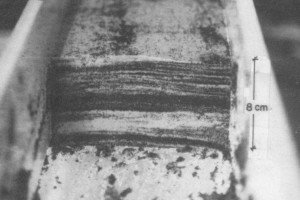 Sedimentary structures of sedimentary deposits of the river “East Bijou” in 1965. This new data questions Stenon’s interpretation by which a relative chronology on the basis of strata could be constructed according to his three principles. To elaborate a chronology one has to refer to the cause being rising and falling marine movements which deposit stratified ensembles called sequences. A growing number of sedimentologists and geologists are adopting the sequential stratigraphic method of reasoning. However they must go further as will be shown. At the beginning of the years 2000 the time had come to apply the knowledge learned from the experiments and completed by other sources on the terrain. Providentially, during a trip to Moscow at that time I met a young geologist Alexander Lalomov who had taken a great interest in my published work. Thanks to him, I was able to have published in 2002 the report of our experiments in the USA in the Academy of Sciences and Institute of Geology in Russia under the heading of Analysis of the main principles of stratigraphy on the basis of experimental data. In 2004 the same journal published my article Sedimentological Interpretation of the Tonto Group explaining the fact that the facies of a geological series were superposed and juxtaposed at the same time in the area of deposit due to the sediments carried by the current. This studies were also published in China. Alexander Lalomov determined the hydraulic and sedimentary genesis of rock formations in several regions in Russia. The most decisive of his works was to determine the time needed for a rock formation to be deposited, such as the cambrian-ordovician sandstone system of the Saint-Petersburg region. Sedimentary mechanics evaluates from the critical speed of paleocurrents and function of particle size, the capacity of sedimentary transport and its speed. The quotient of the volume of the rock formation studied by its capacity, per unit of time and volume, indicates the time of the corresponding sedimentation. This method is applied by a number of sedimentologists amongst which I would cite H. A. Einstein. The time ascertained by this method applied to the cambrian-ordovician sandstone system mentioned above represents 0.05 per cent of the time attributed to it by the geological time-scale. The report of the study was published in 2011 by Lithology and Mineral Resources, journal of the Academy of Sciences and the Institute of Geology of Russia. According to Alexandre Lalomov, the paleohydraulic conditions often have a catastrophic appearance. Golovkinskii (Kazan 1868) on the rocks and Walther on marine sediments established that : Only facies and facies areas juxtaposed on the surface could have been superposed originally. As explained in my 2002 publication the superposed and juxtaposed facies constitute a sequence resulting from a marine transgression or regression. A succession of sequences included between a transgression and a final regression is a « series ». The data from sequence stratigraphy, and the experiments mentioned above, show that a series corresponds to a period. Consequently the sequence must be considered as the basic reference to relative chronology, rather than « stage ». Today, sedimentologists, according to their sub-marine observations and laboratory experiments have established relationships between hydraulic conditions, depth and size of particles. This enables the critical speed of transport below which a particle of a given size will sediment to be determined. The Russian Hydraulics Institute is undertaking at my request an experimental program of erosion of sedimentary rocks by powerful currents (v < 27m/s) to complete these relations. Others should follow. In consequence the geological time-scale is called into question. It should hence-forward be founded relatively not upon superposition of strata, but their origin which implies gravitational action for formation of laminæ, and a turbulent current for strata and superposed and juxtaposed facies of sequences. As to the absolute time of the foliated strata observed by Lyell and assumed to be annual deposits, they are principally laminæ, which as shown by experiment provide no absolute time. The same applies to the 240 million years chronology based upon biological revolutions which Prof. Gohau called an unproven « uniformitarian hypothesis. Professor Gabriel Gohau, said in his book “An history of Geology” (1990)“What measures time is the duration of sedimentation, and not orogenesis or biological revolutions”. This leads to radiometric dating of rocks. The method is no longer viable because of the radioactivity which existed in the magma before it erupted. In a rock sample the respective related parent and daughter radio-active elements produced in the liquid magma were separated. Because of the effect of gravity, it is unlikely the elements would remain together for a ratio to be determined. 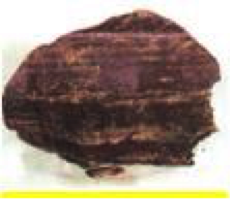 An example is the potassium/ argon dating of rocks resulting from volcanic eruptions whose historic date are known. The radiometric date for the origin of the rock, because of the excess argon is sometimes given in millions of years. Christian Marchal of ONERA, a polytechnician colleague, published in 1996 a study on the subject in Bulletin du Museum d’Histoire Naturelle de Paris (completed by an “erratum” in Geodiversitas – 1997). It was entitled: Earth’s polar displacements of large amplitude : a possible mechanism, and showed that the uplift of a large mountain mass such as the Himalayas would modify by several millionths the moment of the Earth’s inertia, sufficient to displace by several tens of degrees the stable equilibrium position of the poles. This published study stated specifically that large transgressions and regressions would result from the combined effect of the displacement of the poles and the Earth’s rotation large transgressions of the ocean Their amplitude would be much greater than ocean level variations due to glaciation or melting glaciers following cyclical variations of the orbital parameters of the Earth.. In addition to the data of paleo-hydraulic analysis, this could explain, the existences of extensive flood conditions in the geological past rather than attributing them to falling meteorites. As stated in the Bulletin, the North Pole, at Eocene, before the Himalayan orogenesis, was at the mouth of the Siberian River Yenissei, at 72 degrees of north latitude. After the orogenesis, it was nearly at its present position following a movement of 18°. The direction of marine transgressions and regressions following each of the 19 orogenesis since the beginning of the Primary era corresponds to the succession of sequence facies, such as sandstone, clay, schist, limestone. An example is the Tonto Group, in the Cambrian. It proceeds from the Cadomian orogenesis at the beginning of the Cambrian, and results, from the transgression of the Pacific Ocean up to New Mexico. Other directions can be ascertained from other orogeneses which occurred elsewhere on the Earth. Contemporaneous submarine fauna varies according to depth, latitude, and longitude. The apparent change of fossilized marine organisms from one series to another following an orogenesis, could result from different fauna transported by current from different areas caused by successive orogeneses. What has been attributed to a biological change could, therefore, be ecological in nature due to fauna coming from different orogeneses and taking into account the shorter period of sedimentation it now discloses. It should be noted that in recent times collagen, organic tissue has been found in dinosaur fossils and radiometrically dated as forty-thousand years. According to the geological time-scale dinosaurs are said to have become extinct 65 million years ago. The conclusion of this section on geology is that a relation can be established between cause and effect. Orogenesis, which is the uprising of mountains contingent upon volcanic eruptions, is the cause of polar rotational axis displacements. This provokes marine series and creates deposits of sedimentary rocks. The duration of these deposits being much more rapid than the time indicated by the geological time-scale shows the need for a revision of the latter. The causal relation between orogenesis and sedimentary rocks, was the subject of my two recent publications. The « Georesources » journal of the University of Kazan, in December 2012. and ”Open Journal of Geology, at the ”International Conference of Geology and Geophysics”, in Peking, in June 2013, October 2014 at the Kazan geological conference; it has also been presented at the Moscow lithological conference in October 2015 by an American geological engineer Rachel Dilly. In light of the above facts, what remains of Darwin’s theory and the aforementioned ideologies it engendered? The impact of a priori science and its disastrous consequences for humanity calls for objective analysis of science based upon observed fact. Scientific theories in education which could mislead the human spirit in search for truth should conform to experimental proof. Recent centuries illustrate the situation. Copernicus and Galileo asserted without proof that the sun was the center of the world. If they had limited themselves to hypothesizing, as Cardinal Bellarmine had proposed, they would not have been condemned by the Holy Office and thereby the mobility of the Earth would have remained a permissible theory. There would not have been bad feelings against the Church. In the same way if Descartes had stayed with the facts, he could not have based his judgements solely on clear and distinct persuasive ideas, which originally had led Steno to his a priori principles and Newton to his inexact definitions without prior proof. It was in this way that Descartes had originated the Philosophy of Enlightenment which with notoriously anti-religious Voltaire led to the revolution in 1789, the fall of the Bourbon monarchy replaced by Napoleon I, later Napoleon III and the ensuing wars. Objectively speaking, these wars ought not to have happened. Moreover, without historical geology founded upon an incorrect a priori Darwin could not have been led to write his “Origin of the Species”, postulating survival of the fittest between species, upon which Marx and Engels based their “class struggle” theory. Thereby leaving Stalin a seminarist and Hitler a house decorator and thus avoiding the Second World War. Their « a priories » having been exposed, the aforementioned disasters are circumvented. History cannot be re-made. However, by applying objectivity, it should be possible to return to its previous path from a scientific, political, moral and spiritual point of view. Conclusion: The disastrous consequences of « a priories » in the natural sciences would probably not have happened if the sciences concerned had been founded on purely observed and experimental facts. This knowledge should help man in his search for truth. It appears all the more necessary in the critical situation in which we are living. F.Y. 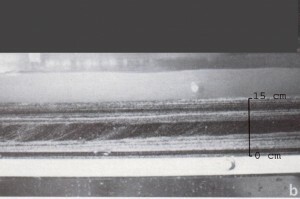 Julien and L.Y., Berthault G., “Experiments on Stratification of Heterogeneous Sand Mixtures”, Bul- letin de la Société Géologique de France, 1993, Vol. 164. No. 5, pp 649-660. G. Berthault, “Sedimentological Interpretation of the Tonto Group Stratigraphy, Grand Canyon Colorado River”, Lithology and Mineral Resources, Vol. 39, No. 5, 2004, pp. 504-508, doi : 10.1023/B : LIMI. 0000040737.85572.4c. J.C. Funkhauser and J.J. Naughton, “Radiogenic helium and argon in ultramafic inclusions from Hawaï“, Journal of Geological Research, Vol. 73, 15/07/1968, pp. 4601-4607. M.R. Rampino and A. Prokoph, “Are Mantle Plumes Periodic ?” EOS Transactions American Geophysi- cal Union, Vol. 94, No. 12, 2013, pp. 113-120, doi : 10.1002/2013EO120001.